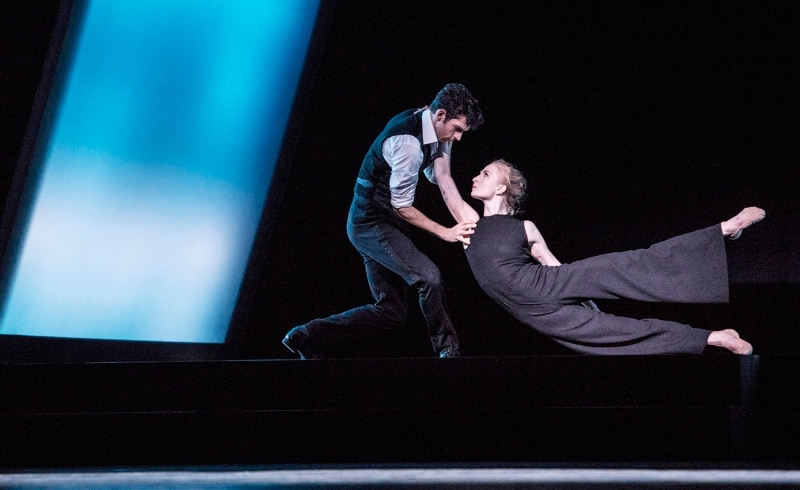 Hedda Gabler, a new production by Norwegian National Ballet (NNB), was not choreographed by a choreographer. This is one of its fascinations. Marit Moum Aune, credited as choreographer and director, has considerable experience as a director for theatre and television, and though she has worked with dancers, she is not dance trained and considers herself mainly as a theatre director. Yet in 2015 NNB boldly commissioned a new work from her, and the result – Ghosts, inspired by the Henrik Ibsen play – turned out to be rather a hit, and was nominated for a Benois de la Danse award. Hedda Gabler is the followup. It, too, is based on Ibsen, and reunites many of the same creative team around Moum Aune: experimental jazz musician Nils Petter Molvær as composer (and occasional onstage trumpeter), set designer Even Børsum, with costumes by Ingrid Nylander and lighting by Kristin Bredal. More intriguingly, it develops Moum Aune’s creative process, in which the dancers generate material through task-based improvisations while she – assisted by ballet master Christopher Kettner, and backed up by dancer/choreographer Kaloyan Boyadjiev, who composed the group scenes – takes the role of editor, director and outside eye. Such a process is not uncommon in theatre or even in contemporary dance (though the director is usually also a choreographer), but it is still unusual in classical ballet. This gives Hedda Gabler much of its distinctive quality. The piece is character-driven, its core a series of scenes that portray inner worlds and interpersonal affairs. The striking prologue shows Hedda as a young girl, in boots, trousers and hat, surrounded by soldiers. Her father, an imposing army general, rewards her military bearing with a gift that presages the drama to follow: a gun. At a stroke, the formative influences of Hedda’s character are laid out: a milieu suffused by power; the haunting presence of her father; and her own sense of herself as “one of the guys”, at the very least equal if not superior to the men around her. The adult Hedda (Grete Sofie Borud Nybakken) emerges from the ranks of soldiers straight into the arms of her first passion, the student Elert Løvborg (Silas Henriksen). Their searingly intense duet is a tangle of snaking clasps and jostling rebuttals, desperate clutches and calculated evasions. It expresses all the ambivalence of the person Hedda has now become: no longer simply one of the guys, but also a young woman, both a subject and an object of desire. Hedda is shown as a woman in a man’s world, with a relationship status that in modern parlance would be summarised as: “it’s complicated”. It serves as a foil to Hedda’s subsequent duet with her bookish husband Jørgen Tesman (Philip Currell) – all painful flinches and wincingly awkward mistimings – as well as her sexily sparring encounter with the manipulative, darkly charismatic Judge Brack (a brooding Shane Urton), in whom she finds both a worthy adversary and a kindred spirit. By the end of Act I, Hedda is shown as a woman in a man’s world (the two other women – Løvborg’s admirer Thea Elvsted and Tesman’s Aunt Julie – are linked through male connections), with a relationship status that in modern parlance would be summarised as: “it’s complicated”. Moum Aune’s treatment of the story brings out convoluted nuances and a real depth of feeling in the dancing, but also has its blind spots, as becomes more evident as the drama draws towards its fatal conclusion. Why is that manuscript so important? Why does Hedda give Løvborg a gun? What’s the deal between Hedda and Brack, between Elvsted and Tesman? Character-driven but not plot-driven, the ballet gives us the flesh of Ibsen’s story, but not the bones. Likewise, Molvær’s electronic score provides moods but not motifs – more atmosphere than impetus. Still, the dancers are excellent, especially Nybakken, Henriksen and Urton in the principal roles (the more timid characters of Tesman and Elvsted afford weaker roles). Børsum’s set is inspired. Drawing room furniture hangs above the stage like Damoclesian swords of bourgeois convention, and the players keep descending below stage and emerging from under it. The overall effect is of characters on an earthly plane, caught between society overhead and the unconscious beneath. So when Hedda finally puts a gun to her head, we may not understand her motive but – with the set itself closing in to push her below stage while the others move freely over it – we do know, very well, that it’s complicated.